I’m looking at the calendar and it’s telling me that we’ve been off the dock for nine days. My brain is having a hard time getting wrapped around the fact that in nine days we’ve completely returned to our cruising life as if we hadn’t taken a three-month hiatus. Forgotten are shopping lists and schedules, driving in traffic, being surrounded by retail mania, and listening to political season madness. Maybe it’s because this cruising lifestyle is so all-encompassing, so in your face, so void of intrusions. Maybe it’s because we lose track of all time and distance, finding ourselves only here and now. Whatever the reasons, we are totally back in the cruising mode; ‘living our life where stress is the enemy’*. It certainly hasn’t hurt the overall sense of perfection, that this week has been ideal in terms of weather, water, wind, and solitude. Anchorages that are busy in the full swing of the season are still uncrowded, nighttime coromels have yet to begin, and the water clarity is exceptional. Our treks between stops have been great too. We’ve gotten to sail quite a bit, and would have flown the Goose, but the Genaker halyard was stuck between the headstay and Genoa halyard, so we settled for a little wing on wing with both headsails. We saw lots of dolphin friends who came to visit, and we even caught some fish along the way – good thing we bought that new fishing license! The Sierra de la Gigante range is lush and green at the moment, which only adds to the crazy beauty of the colored cliffs. When the water changes color you’ve reached the islands! 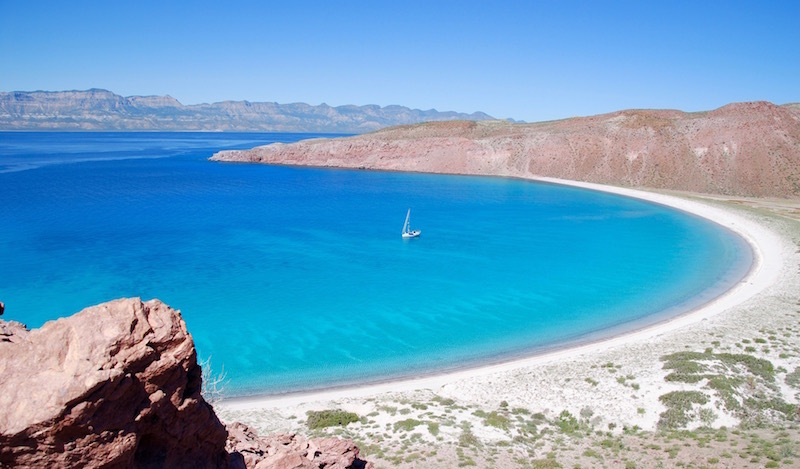 Caleta Partida was our first stop after leaving La Paz; one of our favorite anchorages just 21 miles north of the city. However it’s because of that close proximity that the anchorage is usually full of boats. We were lucky on this early season visit to find it empty except for the Saturday night crowd of big honkin’ stinkpots with their loud toys and music, who anchor at sunset, unload the toys for a quick run around the bay, load up the toys, party all night and leave at sunrise…ah, gotta love those nature lovers! We spent 5 days in Caleta Partida and the first few days and nights were HOT, so most of our time was spent swimming around the boat, or just floating toes up while drifting. I’ve often thought that if I was ever ship wrecked, that I could just lie on my back and float home. The water temp is 80+ degrees, and the clarity is some of the best we’ve seen. Floating by the boat in 15’ of water while watching the fish swimming in the shadow of the hull, it doesn’t get much better! Our next stop was at the south anchorage on Isla San Francisco. We’ve been there many times and always love it. This time however really topped them all. We had the bay to ourselves, there was just a light offshore breeze to keep us cool, and the water was perfect. While there we walked over to the other side of the island where we like to hunt for agates. On the way back we noticed the trail leading up to the ridge trail, one I’d always wanted to hike. Since I didn’t have my camera with me Marty rowed us back to Happy Dance, and then back to the beach to begin the hike up to the ridge. The trail was easy at first but once I actually got to the ridge it was a bit scary! Both sides of the trail dropped down in rocky slides, so I made sure I focused on one foot in front of the other and soon I was at the top. Spectacular views all around the Sea of Cortez, and of course the best one was looking down on Happy Dance floating above her reflection in an aquamarine world. Ah, time for a swim after a hot hike! We left Isla San Francisco intending to stay in Bahia Los Gatos (so named for the jaguars that lived there), but the wind wasn’t favorable for the anchorage so we pushed on to Bahia San Marte. We were glad we did, as it was picture-perfect. Another solo anchorage, light offshore breeze, reefs protecting us from the swell, and great snorkeling. The lush green on the usually dry hillsides made us feel like we were in Hawaii or Polynesia, not the Sea of Cortez! So there you have it; our first foray into our fourth season of fun in the sun, sea legs and sea brains all operational. Tonight we’re in Puerto Escondido in order to get a few more provisions and fix a couple of SSB/Internet problems we were having. 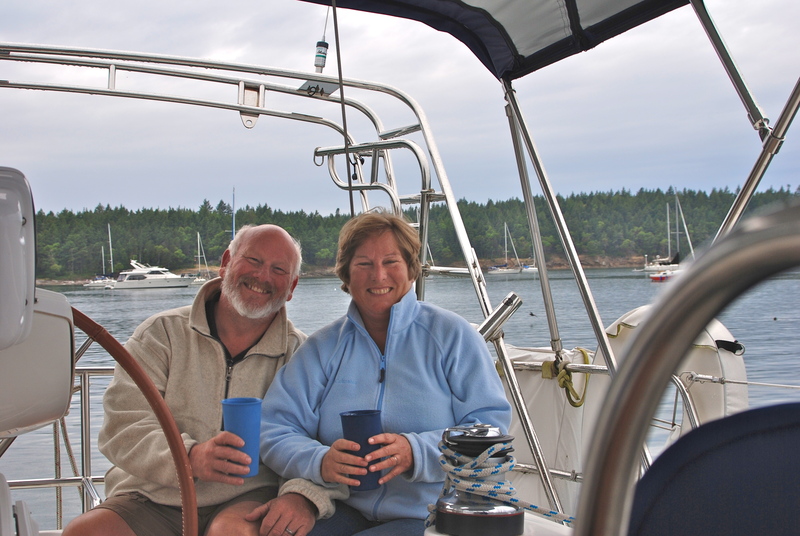 With the chores out of the way we’ll head back to the islands tomorrow and track down our cruising buddies. La vida es muy bien!!! *from lyrics by Kenny Chesney…name that tune! Sue- your updates and photos make me feel like I’m there with you two! So glad you are out on the sea doing the Happy Dance thing!